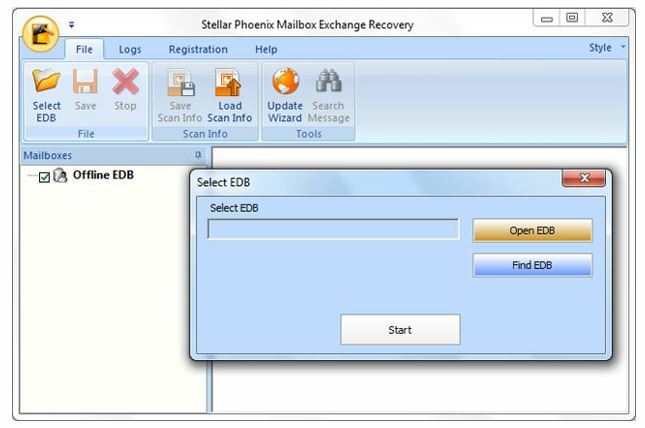 Stellar Phoenix Mailbox Exchange Recovery tool recovers corrupt EDB (Exchange Database) files and extracts emails, contacts, calendars, tasks and other mailbox components from inaccessible user mailboxes. The Exchange Server EDB Repair tool scans Exchange files to extract data that is recoverable. After recovery, the data is restored to Microsoft Outlook proprietary PST file format. This makes it quite easy to access the EDB data into Outlook mailboxes independently and moreover, the PST file can be imported in MS Exchange as well. One major attribute of the tool that I feel worth appreciating is its ability to export recovered files to live Exchange Server. One pre-requisite to enable this feature is granting full rights to the disconnected mailboxes via Server Console.exe. Other than corrupted EDB recovery, the software offers to recover EDB mailboxes that are deleted accidentally or intentionally. This feature helps when user suddenly realizes that the mailbox data that they just deleted is actually required for future reference. With ability to store data into PST file format, the tool also supports EML, MSG, RTF, PDF, and HTML formats. 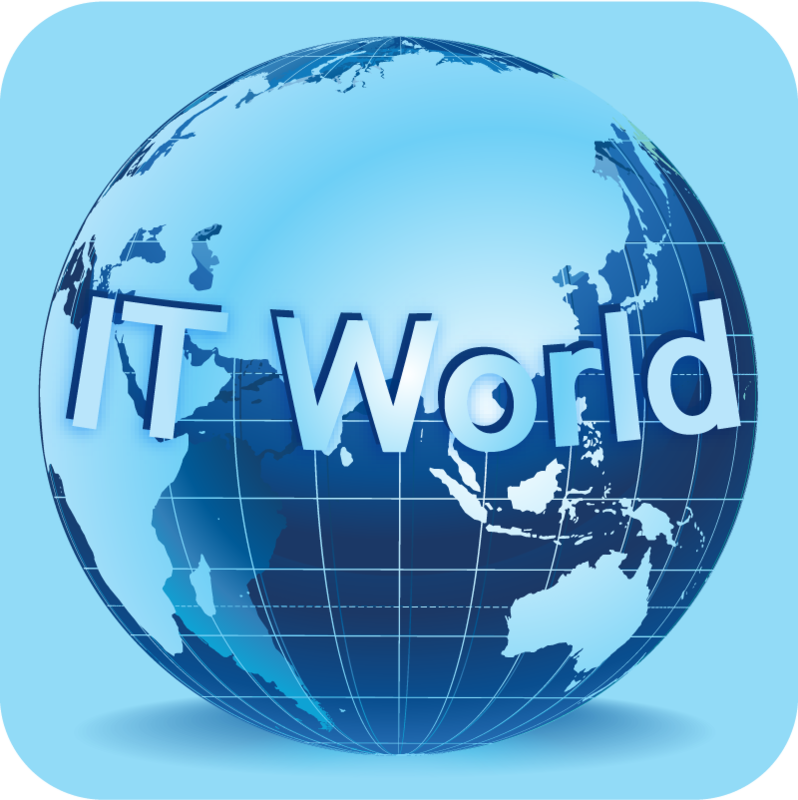 This offers more accessibility to Server data as the files can be imported to several other web and mail clients. The tool serves as a time consuming recovery method as it proffers selective recovery of mailbox data. It offers to save important EDB files while dumping those that are not required at the moment. 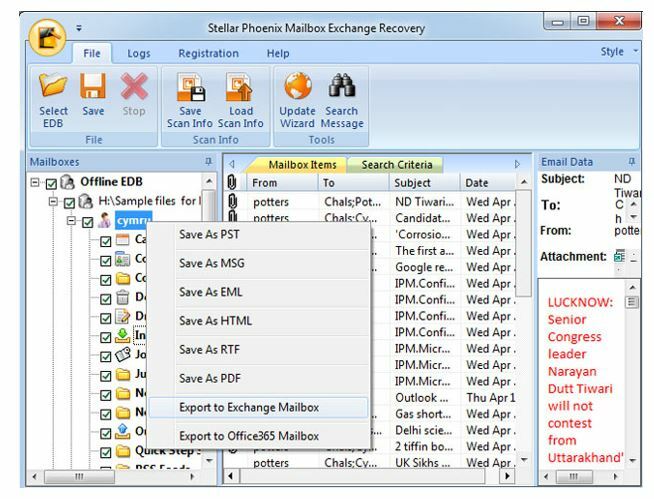 The tool generates the preview of the recoverable items within the panel before initiating the process to restore Exchange Mailboxes. It can be considered a powerful feature as the user can analyze what data can be recovered with the help of the tool. The tool supports Unicode EDB files and is available in multiple languages. These features make the tool more scalable as users from non-English speaking background can select the preferred language and utilize the tool. Now, after exploring the features of the tool, let’s understand the functional criteria to know how it helps in Exchange Disaster Recovery. 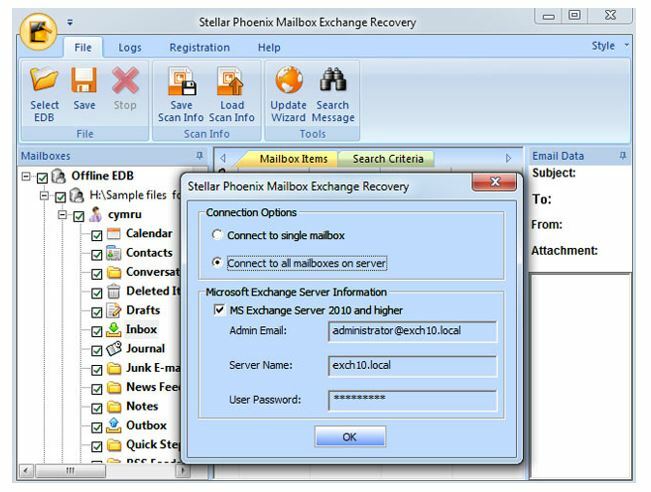 The initial window of the Mailbox Exchange Recovery tool appears as shown below. It gives you the option to Open or Find the corrupted EDB file that needs to be recovered. You can select to open the file or find the file in case the location is unknown. Here, I have selected Extensive Scan as the level of damage to the EDB file is quite high so thorough scan is required. The time taken by scan process completely depends upon the volume of file and the intensity of corruption in the EDB file. After the Scan is completed, the tool displays all integrated components of the EDB file in the left panel. When we select a folder from the left panel, its integral items are displayed in the middle panel. Next, selecting an item in the middle panel will generate the preview in right panel along with the attributes.Here, I will not able to see the enclosed attachments in the right panel for the email items being selected in the middle pane. Next, select appropriate item that needs to be recovered and then select the file format the recovered data needs to be exported Note: Here I have selected to save the file into PST as this file format is supported over multiple email clients. Once the recovered file is restored on the machine, the tool notifies for the same. 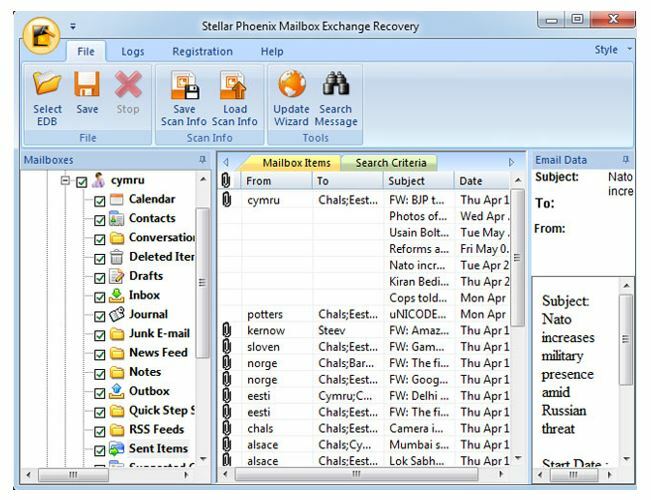 The best thing which I feel about the software is its ability to Export the recovered mailboxes directly to Live Exchange Server. 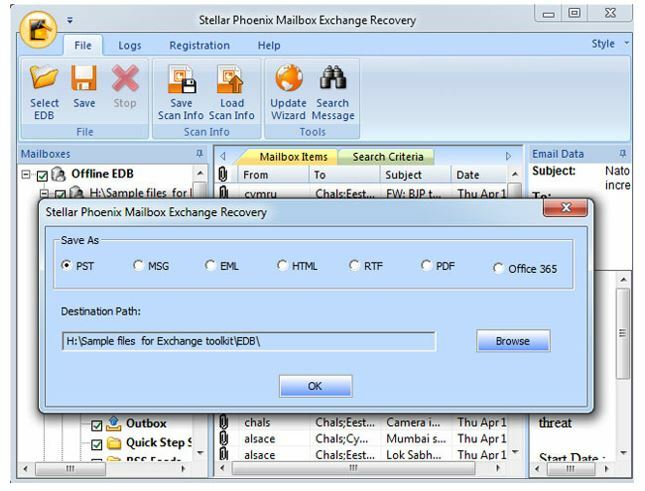 I didn’t want to export the recovered mailboxes to Live Exchange but I would still show you how to do it. In the next step, Enter live server credentials in the dialog box to export mailboxes content directly to Connected Exchange server mailboxes. A list of mailboxes will appear once you enter the credentials. Select the mailbox in which you want to export the mailboxes. Rest the software will do it for you. The final step is of course to see the file that is recovered using the tool and import it into preferred email application.Pros & ConsAs per my experience, the interface and functionality can be concluded as straightforward with self-defined procedure. The tool has the ability to recover data from all EDB folders including priv.edb and pub.edb.Although, the tool is designed to recover corrupted EDB Mailboxes, it can be used as a conversion medium for exporting EDB mailbox data to Outlook PST and other file format as this enables to access the data independently without Server bound environment.The only thing that requires improvement is that the tool does not offer preview to email attachments within the panel. However, this single ambiguity can be compromised considering the cost at which Exchange Server recovery is available. Final VerdictUndoubtedly, Exchange Administrators are averse to corruption and failures; they have to perform recovery at some point in their career. Corruption is rare within Exchange, but there are factors that lead to it. 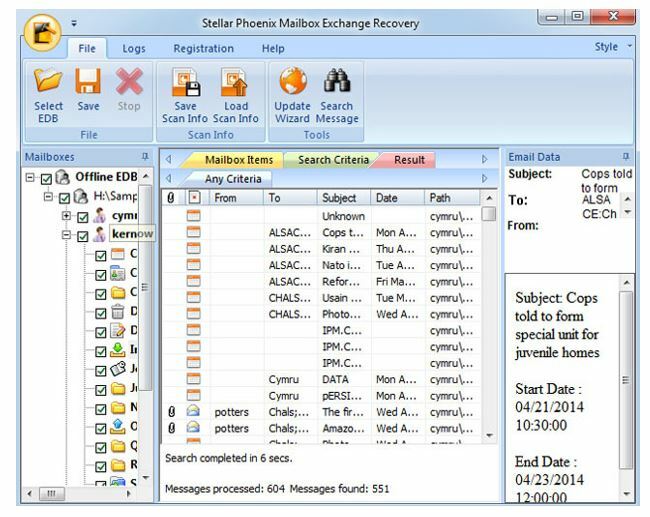 When it takes place, Stellar Phoenix Mailbox Exchange Recovery is a potential solution to recover mailbox data. Mailboxes can be reinstated without any loss of data and folder hierarchy is maintained throughout the recovery procedure.